For the first time ever, we're set to get four new Samsung Galaxy Note devices. The Galaxy Note 10 is expected to come in four flavors, with one of the three said to be a cheap, smaller model, not entirely unlike the newly released Galaxy S10e. Samsung launched the Galaxy S10 phones a while ago, with the company releasing a total of four models, for the first time in the series. That could very well be the theme moving forward, as substantial rumors have it that we will also be getting four Galaxy Note 10 models. New information has given us more details of the four devices. For one, we now know what their model numbers will be: SM-N970, SM-N971, SM-N975, and SM-N976. The first two are essentially the same device, with the only difference being that SM-N971 has support for 5G. The latter two also mirror that relationship. 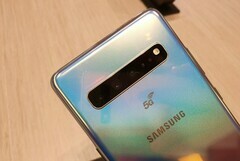 Essentially, we will be getting two devices, SM-N970 and SM-N975, with each further having a 5G variant. SM-N970 is expected to be the cheaper and smaller of the two. It’s supposed to measure in at 6.28”, which is admittedly a tad small for a Galaxy Note. There’s a chance it could be sold as the Note 10e, much like the S10e. SM-N975 will be the more expensive one, and could have a 6.75-inch display. Got questions or something to add to our article? Even without registering you can post in the comments!